Make no mistake-big bird is in the fridge waiting for his day in the oven. Here is a recipe option for the next day. Lentil soup is your ticket to a balanced meal in a bowl. All good, no excess. Best of all, the taste of lentils is comfort personified. The most challenging part is cooking without burning them. Once, the soup starts to cook down, the lentils get sticky. First they stick, then they burn. If this happens, kill the burner, take a whiff, if you don’t smell BURN, cover them and give them a few minutes to unstick themselves. Then, add a little water, stir well, turn them on and start again. If you have burned them -quickly get another pot and pour the soup in it- you can scoop down to the bottom except for the burned lentils (or you will have the scorched flavor for dinner- which I don’t recommend). Try it! Put washed lentils, salt, garlic, oil and water into a large pot on low heat. Bring to a boil slowly, so it doesn’t boil over. Cook for at least two hours, uncovered stirring regularly. When the water has cooked down after about 45 minutes, set a timer and check it every 15 minutes, stirring it well. You may need to add more water. 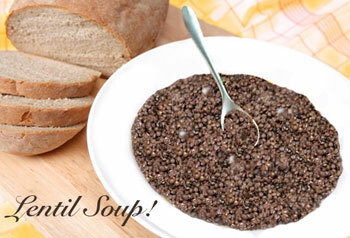 Lentil soup takes well to add-ons- like chicken broth in lieu of water, or adding leftover pasta or rice after cooking. Some like to add vegetables or a little tomato. I like it plain- with hot Italian bread and butter.